Dried ginger (Ganjiang)-Zingiber officinale (Willd.) Rosc. Botanical Name: Zingiber officinale (Willd.) Rosc. Part Used & Method for Pharmaceutical Preparations: The rhizomes are dug in winter. After the fibrous roots have been removed, the rhizomes are cleaned, dried in the sun and cut into slices. Properties & Taste: Pungent and hot. 1. Cold attacking the spleen and stomach manifested as cold pain in the epigastric and abdominal regions, vomiting and diarrhea. Dried ginger (Ganjiang) is used with Evodia fruit (Wuzhuyu) and Pinellia tuber (Banxia). 2. Weakness and cold in the spleen and stomach manifested as fullness and distension in the epigastric and abdominal regions, vomiting, nausea, loose stool, poor appetite, lassitude and deficient, weak pulse. Dried ginger (Ganjiang) is used with White atractylodes (Baizhu) and Poria (Fuling) in the formula Lizhong Wan. 3. Collapsing of yang manifested as cold sweating, cold extremities, spontaneous sweating, listlessness and fading pulse. 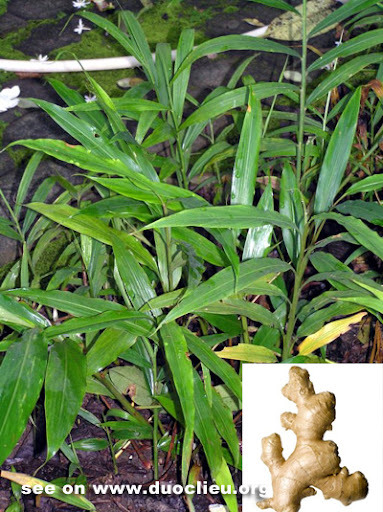 Dried ginger (Ganjiang) is used with Prepared aconite root (Fuzi) in the formula Sini Tang. 4. Cold phlegm in the lungs manifested as chills, asthma, cough with clear and profuse sputum and cold feeling in the upper back. Dried ginger (Ganjiang) is used with Ephedra (Mahuang), Asarum herb (Xixin) and Pinellia tuber (Banxia) in the formula Xiao Qinglong Tang.